The DAA thanks our Partner Unforgettable.org for allowing us to re-post this blog. • They’re vulnerable and you need to protect them. • It would be irresponsible to let them do certain things. • You’d never forgive yourself if they came to any harm. The vast majority of carers have the same understandable concerns, but it is possible to find a way to overcome your worries so that your loved one can continue to enjoy life to the full. Life is full of risks – there really is no escaping them. It’s not only impossible to keep the person you love away from risks, it might not be in their best interests either. Staying at home all day with you might be the ‘safest’ option, but it probably won’t be the most enjoyable, and it could make life very boring. This, in turn, may leave them feeling lonely and isolated or frustrated and prone to angry outbursts. Besides, Person Centred Care means respecting the rights and opinions of the person with dementia, even if some of the activities or tasks they want to do involve risk-taking. Did they take risks before having dementia? For example, did they enjoy sailing, skiing or taking part in any other activities with clear risks involved? Some people are bigger risk takers than others and understanding the sort of risk-taker your loved one has always been is a good indication of how they would like to live now. Don’t worry, you’re bound to feel a bit uncomfortable. After all, this approach might challenge some of your most basic assumptions about your role as a carer. When we think about taking risks, most of us associate them with danger, fear and uncertainty. 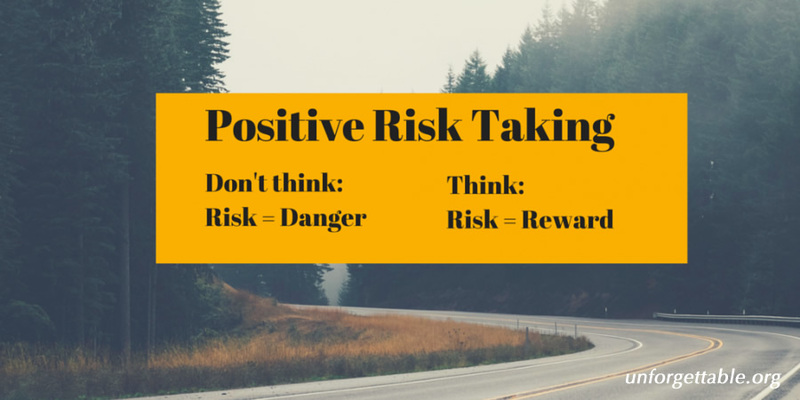 However, risk-taking can also have many positive outcomes. For example, if the risk pays off, a person with dementia might gain a huge confidence boost, and a sense of satisfaction which far outweighs the initial risk. Risk v Danger – what’s the difference? Risks can’t be eliminated…but negligence can. There’s a big difference between taking a measured, calculated risk which has been carefully discussed with everyone involved, and making a rash decision without thinking it through or fully understanding the consequences. Whether it’s allowing someone with dementia to catch a bus into town, prepare their own meal, or fly to Australia to visit loved ones, the steps you need to take when assessing the risks involved, are broadly the same. For example, they might catch the wrong bus, or get lost in town. They might burn themselves on an oven, or take ill on a long haul flight. 2. Ask yourself: How likely is it they’ll come to harm? For example, could you take them to the bus stop yourself, make sure they have an identity card with them and a simple mobile phone. Could you consider using a tracking device? Could you make the kitchen as dementia-friendly as possible to limit the risk of accidents, or turn the cooker off and leave a selection of cold meats, salads, bread and cheese for them to create their own cold lunch? 3. What might be the severity of the harm? If a long haul flight really could make them terribly ill, it might not be worth taking (you probably wouldn’t be able to get travel insurance anyway) but if the worst thing that could happen when they’re in town on their own is that you have to go and collect them because they got lost – maybe that’s a risk worth taking? If making their own lunch gives them a sense of control, achievement and normality, surely that too has to be worth considering? Make this as detailed as possible, outlining the physical, emotional and social benefits of taking this particular risk. For example, a trip to town provides physical activity, getting there on their own will be a great confidence boost, and meeting other people will provide social stimulation. Everything from tracking devices to a simple mobile phone can enable someone with dementia to take risks which will allow them to maintain a sense of independence and control in their own lives. Talking to other carers, families and friends of those living with dementia can be a great way to get support, tips and motivation to do something different. Find out where your nearest memory café is or join our community. Remember, nothing ventured, nothing gained! As awareness of dementia continues to grow, dementia friendly communities are beginning to emerge which should lessen the risks of people with dementia having a bad experience when they’re out on their own.